The THRIVE Mindfulness Project is hosting an interactive event called REFLECT + RENEW on Thursday, August 9th in Martha’s Vineyard. 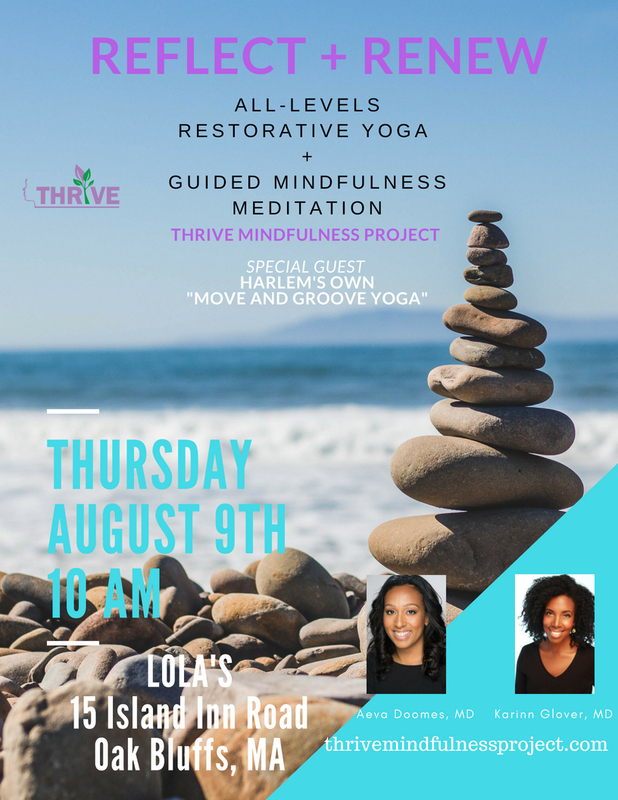 The event will include a relaxing session of restorative yoga led by the inspiring Harlem pop-up studio, “Move & Groove Yoga”, as well as a guided mindfulness meditation by the co-founders of THRIVE. The "all-bodies welcome" open-level relaxation yoga will add to the guided mindfulness meditations and focus on embracing the power of living in the moment. Our guided meditation will highlight and impart basic mindfulness skills. REFLECT + RENEW is an event that will teach and demonstrate mindfulness skills necessary to think, be and live in the moment. REFLECT + RENEW will be an inspiring event that will bring women together to share in an amazing morning of enlightenment and meditation. WE WILL SEE YOU IN AUGUST AT LOLA'S! The co-founders of Thrive Mindfulness Project are skilled in Mindfulness Based Stress Reduction (MBSR) techniques, and are committed to teaching and sharing the benefits of mindfulness. Mindfulness allows for presence 'in the moment' in a gentle, nonjudgmental way – and has become a “best practice” for business as it supports mental flexibility and decision-making, as well as resilience. Mindfulness also provides clarity and focus by teaching how to look inward and develop skills that will enhance the ability to enjoy life and live in our lives and not through them. Research has shown that mindfulness meditation provides an opportunity to develop skills that can enhance performance and leadership in a complex environment. During the THRIVE Mindfulness Project workshops and seminar sessions, busy people who have “no time to meditate” will learn stress-reducing, performance-enhancing skills they can use immediately, in sessions developed by our co-founders. Rather than a life of 'leaning in,' THRIVE mindfulness project will teach attendees how to find clarity and focus to live within each moment. Contact THRIVE today to discuss pricing and more details about our offerings listed below. using THRIVE mindfulness based techniques. which results in higher organizational performance. how it can keep you and your employees HAPPY + HEALTHY. THRIVE Mindfulness Leadership workshops engage valuable members of your organization to help them develop 'mindful leadership skills' that foster empowerment, and increase their ability to INSPIRE + MOTIVATE other team members. Our leadership learning modules focus on how to EMPOWER + ENGAGE by using mindfulness based stress reduction techniques when working with both employees as well as clients. fresh ways of interacting with mindfully with clients and colleagues with deliberate focus. We will work with your organizational core beliefs while also incorporating useful THRIVE mindfulness practices that directly affect life enhancement and performance. A leader can be anyone in a company or organization, but is often confused with authority. 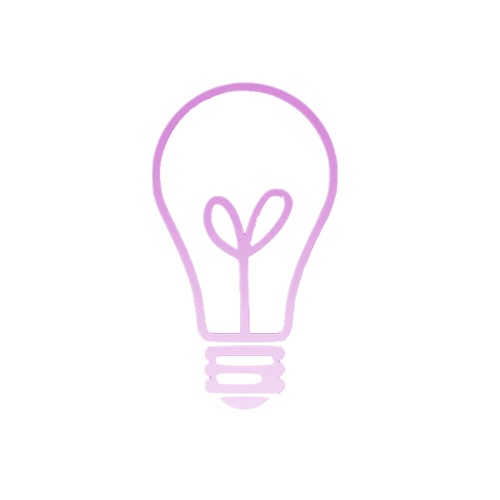 The Mindfulness Project's goal is for individuals to learn unique techniques to enhance their leadership styles, promote creativity, and sharpen problem-solving skills to use during pivotal moments in their work day and personal lives. The ability to manage your emotions and remain calm under pressure has a direct link to your level of performance. Top performers are skilled at managing their emotions in times of stress in order to stay calm and under control. The Mindfulness Project will teach the skills and techniques necessary for individuals to perform at their highest level in any situation. It is imperative that individuals find a suitable balance between their work and their life demands. Work-life balance can increase workforce productivity, and employee retention and attraction. The Mindfulness Project will work with individuals and teams to DECLUTTER, BALANCE + FOCUS energy. Our seminars focus on those who aspire to positions of greater authority and influence within their company or organization. Led by board certified psychiatrists who specialize in career and professional development using mindfulness based stress reduction techniques, our seminars are an optimal learning environment to share and analyze the unique challenges and opportunities facing those in leadership positions. Mindfulness leadership is based on ancient principles of meditation and is used by numerous mainstream organizations, like Google, Apple, Target and GM. A recent article in Forbes outlined the ways a major corporation benefited greatly from mindfulness principles in the workplace. 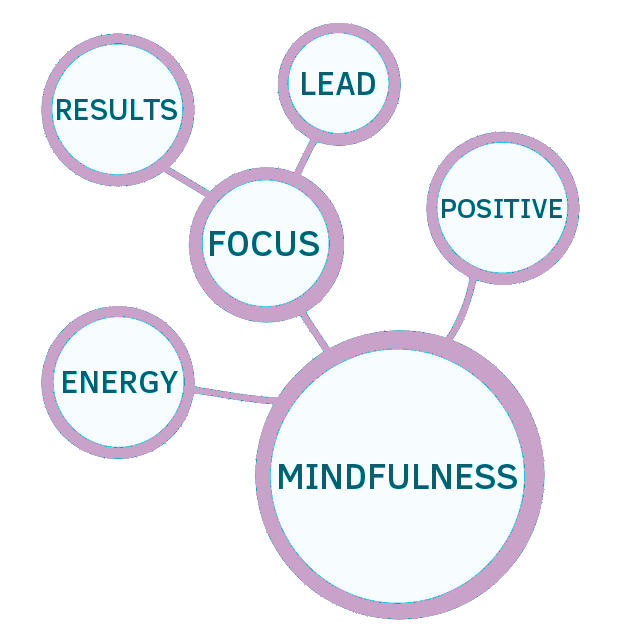 THRIVE Mindfulness Leadership Seminars also provide a great opportunity for managers leading teams with direct reports, as well as entrepreneurs and business owners. There is a reason Harvard Business Review calls mindfulness a "must have" for the modern executive. When your employees THRIVE, your organization THRIVES.